HYDERABAD: Home to a majority of IT companies in the city, Serilingampally is sitting on a time-bomb that is ticking slow and steady. Fluoride levels in the groundwater of the mandal – comprising Gachibowli, Manikonda, Kondapur and Madhapur – exceed much beyond the safety limit. Fluoride level in groundwater samples from Serilingampally was recorded to be 2.26 mg/L (milligrams per litre) above the safe limit of 1.5mg/L set for drinking water by the Bureau of Indian Standards, as per analysis of groundwater samples by Telangana groundwater department. However, the issue is not just limited to Serilingampally but several places across the State. 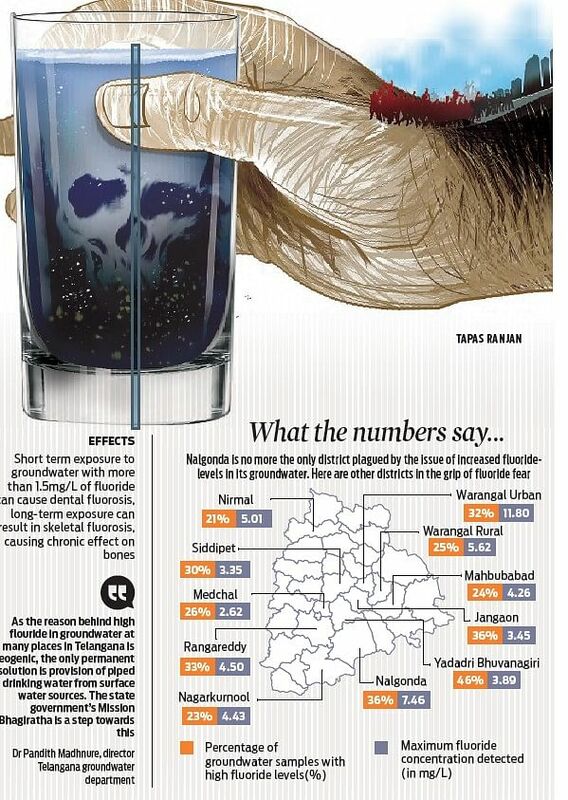 This shows that the issue of high fluoride levels in the groundwater of Telangana has not limited itself just to Nalgonda – once called India’s fluorosis capital – but has spread its tentacles to several other districts now. Interestingly, when Telangana groundwater department analysed over 4,000 groundwater samples in 2017 collected from across the State, it found that while in Nalgonda fluoride levels were found to be exceeding the safe limit in 36 per cent of the samples, in Jangaon, Medchal, Rangareddy, Siddipet, Warangal (urban & rural) districts, over 25 per cent of the samples were found with high fluoride levels. In many of the remaining districts the levels were anywhere between 10 and 20 per cent. What raised the eyebrows of the officials was the fluoride level in Yadadri’s groundwater samples, which was higher than even Nalgonda: 46 per cent. Nature is not to be completely blamed for Telangana’s fluorosis fiasco. The man-made aspect of this issue is digging deep bore-wells. Most of the bore-wells sunk in the State are way deeper than the Water, Land and Trees Act’s (WALTA) permissible 120 metres (394 feet). Several bore-wells are sunk to depths of more than 1,000-2,000 feet, in urban as well as rural areas. It is not just a coincidence that when the Groundwater department measured depth to groundwater levels in August, districts with high fluoride levels in groundwater, namely Jangaon, Medchal, Rangareddy, Siddipet and Warangal, were also the districts with deep groundwater levels. He stated that while using a Reserve Osmosis purifier will reduce fluoride levels in groundwater, a lot of freshwater is wasted. While government is supplying piped drinking water from Krishna, Godavari rivers and other surface water sources to many places, still a good percentage of population does not get piped drinking water. As per the State’s own data from the Telangana Social Development Report-2017, 13 per cent households in rural areas and 2.4 per cent households in urban areas of the State rely mainly on bore-wells for drinking water. Even for those who get piped drinking water, frequency and duration of supply is a major concern. Although piped drinking water is supplied by the State, many rely on bottled water supplied by private companies, many of whom operate bore-wells and extract groundwater illegally.